For the second time, the Exquisite Gardeners are interpreting themes found in the novel Station Eleven. This exhibition addresses the central role that the arts play in our lives. A central concept of the novel Station Eleven is that survival requires more than basic needs, that there is value in art and creative expression that makes it intrinsic to life. 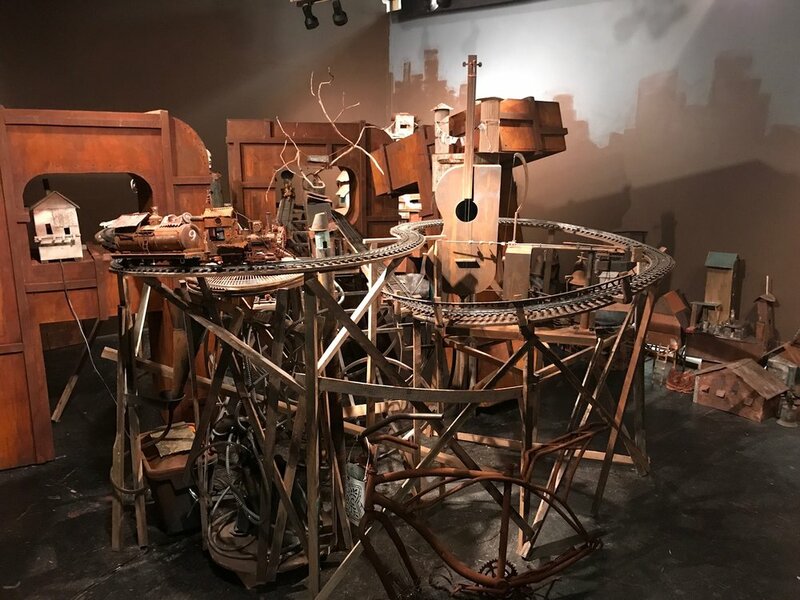 The Exquisite Gardeners will use their storehouse of discarded and familiar objects and build a scale dystopian environment with trains, bells, and whistles. Hey Everyone! The Exquisite Gardeners are showing up September 11th through the 29th at the historic ICB building in Sausalito , California to create a themed project, the " Station eleven Project", based loosley on a dystopian novel by Emily St.John Mandel. 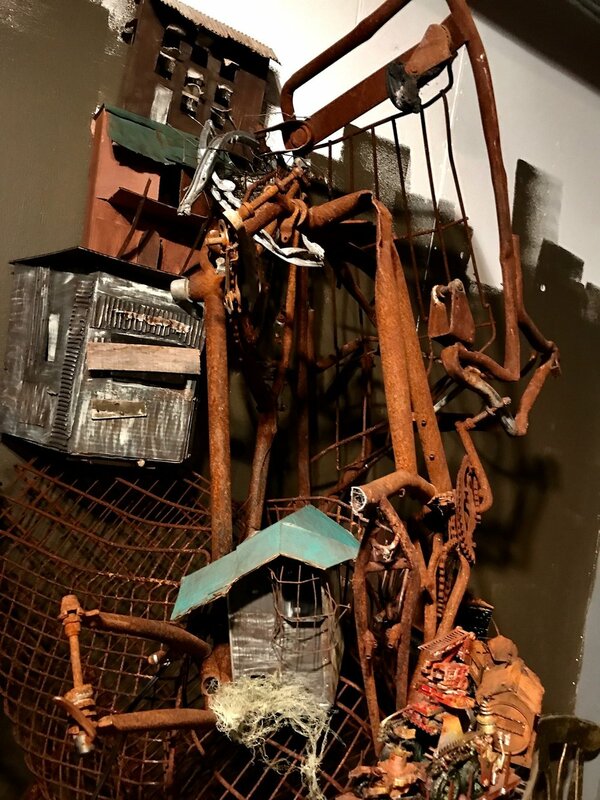 The installation will be in the Gallery 111 within the ICB.The novel connects the themes of despair and hope, loss, and discovery, decay and rejuvenation, perfect material for our troupe of creatives. Sam Dantone is coming down from Oregon with his crazy art mind and skills, and the Guthrie brothers, Don and Ralph, contributed amazingly altered G scale train cars and engines for the kinetic element we want to add to this years installation. The last two weeks of the project we will invite the artists within the building to contribute their creative minds , hearts, and hands to the project. Keep posted for pictures of the event sometime in October! The WONDER PROJECT emerged from our desire to experience some community outreach work. We Gardeners believe that we should share the fun we have in creating wonderments with everyone. Joe B. recalled the concrete poetry movement of the late 60's and early 70's, wherein the size and shape of the letterforms in poetry had as much to do with content as the word, or words themselves.Viola! Jeff H. and Tim K. and Joe worked on creating huge letters that are sculpture as well as content -evocative...WONDER was the word chosen after much discussion by the more literary-minded of the Exquisite Gardeners...Deepa J. put in the most input, and WONDER won out! Then all the logistics of building, storing, and delivery came down the pike..but, bottom line, we had a great time, especially with the kids, who never miss an opportunity to play in the paint! Images showing the raw letters transitioning to primed letters and volunteers who have really gotten into their work. We Exquisite Gardeners take on any project anytime. Throw it down and we will pick it up and run! So May 2nd and 3rd we are carting down our big WONDER word to Mission Viejo Cultural Center to mix it up with young and old and in between to adorn our letters with colorful assertions, musings, and poetic thoughts and images of what wonder is. I wonder? Next projects Radical Creativity Workshops! Who is this guy? He is the subject of our Radical Creativity Workshop coming up at the Verge Center for the Arts in Sacramento, CA. Sorry, you will have to come to the workshop to find the answer! A SMALL GROUP OF THE EXQUISITE GARDENERS ARE TRAVELING TO SACRAMENTO , CALIFORNIA MARCH 10, 11 , AND 12 TO GROW A SMALLISH BUT IMPRESSIVE EXQUISITE GARDEN . WE HAVE BEEN INVITED TO THE ANNUAL CALIFORNIA ASSOCIATION OF PARK AND RECREATION CONFERENCE AT THE SACRAMENTO CONVENTION CENTER . WE INTEND TO STAND OUT IN THE HUGE SPACE OF THE CONVENTION CENTER WITH OUR OWN STYLE OF EXHIBITION, COMPLETE WITH NICE RUSTY STUFF, AN OLD CHAIR GARDENER JEFF HVID JUST FOUND WASHED INTO THE BEACH, A VERY IMAGINATIVE ANTIQUE CONEY ISLAND STYLE GAME THAT GARDENER JEAN GUY HAS BEEN LABORING ON, ALONG WITH CONTRIBUTIONS FROM LEXI BOEGER, DEEPA JAYANTH, AND LOTS OF WORK FROM OREGONIAN SAM DANTONE. WE ARE SURE HOLDEN CRANE WILL BRING SOMETHING STUNNING TO THE PARTY TOO! IN ADDITION TO THE CONVENTION CENTER INSTALLATION WE ARE DOING A MINI " RADICAL CREATIVITY" WORKSHOP AT THE WONDERFUL VERGE CENTER FOR THE ARTS, A CENTER OF INNOVATION AND CREATIVE WORK IN SACRAMENTO. MAY 2 AND 3 WE ARE TRAVELING DOWN TO THE MISSION VIEJO CULTURAL CENTER TO DO A " RADICAL CREATIVITY" WORKSHOP WITH COMMUNITY VOLUNTEERS. WE ARE LOOKING FORWARD TO MIXING IT UP WITH ALL AGES OF CREATIVE HUMANS! 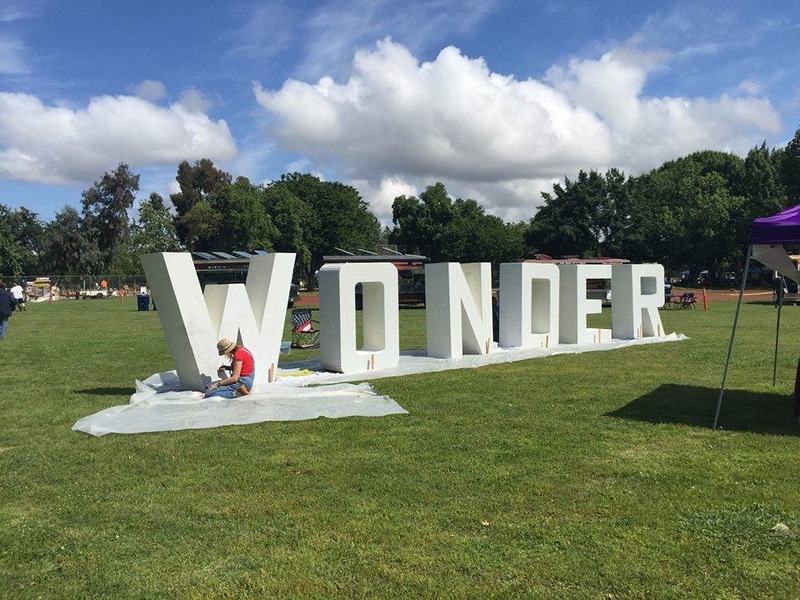 FOR THIS OUTDOOR WORKSHOP WE HAVE BUILT ( THANKS GARDENERS JEFF HVID AND TIM KARJALAINEN ) , HUGE SIX FOOT BY TWO FOOT DEEP LETTERS THAT SPELL OUT THE WORD " WONDER" . THIS EVOCATIVE WORD SHOULD LOOK PRETTY IMPRESSIVE ON THE GROUNDS OF THE CULTURAL CENTER AND WE CANT WAIT TO TO PAINT OUR IMAGES AND WORDS OF WHAT WONDER MEANS TO US ON THE SURFACE OF THE LETTERS, ALONG WITH THE VOLUNTEERS. AS USUAL, WE WILL CREATE A LOVELY MESS TOGETHER, THEN STAND BACK, AMAZED , AT WHAT WE HAVE ACCOMPLISHED! 'Lexi B. striking her rock star pose...in front of the amazing 1930 Chevy truck we borrowed from the ranch she lives on , Boeger Winery. Merryll S. and Sam D. with treasures soon to be placed SOMEWHERE in the installation. An improvisational sculpture install by yours truly and Don G.
Old school hand sign painter Don G. working on Gardener Will B. 's shed installation. New Gardener Deepa J. pausing from toiling away producing gorgeous drawings of our installation work. Exquisite Gardener's Beth Mullins in Sunset magazine! Greetings all EG followers! Wanted to share with you a coup by Exquisite Gardener Beth Mullins, who got awarded the honor of making a "model" garden for the Sunset magazine's once a year Wine and Garden gala at the Sunset magazine headquarters in Northern California. Sunset then published the chosen gardens for the Fall issue of the magazine. I have included the page below. As some may know, Beth is a talented artist and the only one of our collective who is also an actual landscape designer..a REAL Gardener, not just a metaphorical one! Beth also has a PHD in Microbiology, which I am assuming helps with the plant Latin terms? Anyway, congratulations to Beth. Here is the Sunset magazine spread…. Jeff Hvid was there when it all began in 2009, and has been a solid contributing member ever since. I call Jeff the Thoreau of Marin County, California, because he loves the natural world here more than anybody. For 30 years or so Jeff has been , on his own time, with no recognition, been cleaning the creeksides and shorelines of this County. He started piling up the stuff he dragged up the hills onto the road into "art" because he didn't want folks adding their own junk to the pile before he could get back to pick it up. I have followed Jeff down to creek bottoms and seen his installations of old wood and shoes etc., artfully arranged around the often- seen graffiti at bridges and overpasses here in the County. It was like encountering a magical place where the junk just got up and arranged itself into art. Before I saw these, I don't think anybody else had. Jeff knows the flowers, plants, birds and animals here like nobody. To hear his stories of seeing a mama otter swimming with her kits in the creek, while above on the sidewalks people stroll on unaware is mesmerizing. I have seen a hidden world right here in our County by hanging out with Jeff. Below is a typical Jeff Hvid piece.It is made from a shore-scavenged boat seat part, with discarded Bic lighters that Jeff cleans up after the fisherman who use them leave.They are wired onto the wood frame with scavenged wire, and this piece shines like a stained glass window in the light. There is much Museum shown "fine art" that aspires to this level of respect for materials and social good at the same time, but few are as unself- conscious as this piece. MaryLee and Suhas having good times with junk! Don G and the famous Tim W. looking pleased. Gardener Terry B. at work. Showing the results of Exquisite Garden intensity. A nice view of Gardener Deepa J. 's superlative drawing/paintings...we love her addition to the Gardeners! Here we are at the Museum of Craft and Design in San Francisco making Magic happen ! This is a nest structure that has morphed shape a couple times... We are on our fourth day of creation and it is good!!!! Gardener Will working on his composition. a view past the Chevy flatbed toward Deepa and Benva. Here is a picture of Gardener Joe B. and Mike, who keeps a watchful eye on all the goings on at Linden Street and Campovida, site of our NEST project. Rumor has it that Mike likes to carve wood...Joe gave him some carving tools and wood...of course with ulterior motives...Mike will surely be asked to join the Gardeners next Bay Area event! A wrap up: The Gardeners worked their collective and collaborative tail feathers off on the NEST PROJECT, and, I admit, dear blogaphiles, I was a bit apprehensive the first day...but after the big work of unloading and stripping leaves off the Arundo cane, I could sense that the Gardeners had a head of steam up and weren't going to let NUTHIN' stop them from building a friggin' giant nest. It was hot work, as the temps were up there, and the sweat and sunburns combined to push the Gardeners hard. At the end of the first day, the NEST was essentially built, tall, shaggy, and, thankfully, quite imposing against the Oakland sky and hardscape. The next two days were composed of lots of creative discussions, loud music, good food, locally at Chop Bar and Miss Ollie's, and also back at the ranch with the usual Gardeners-who-love-to-cook doing their thing. By the afternoon of the third day we were well along, a bit dingy, especially after the 4:30 PM union cerveza break. We sat back, and as is usual now after 5 previous installations, were proud and kind of amazed at this giant thing we accomplished, and were exhausted, and sad that it was over. We really love doing this crazy thing. Gardeners, as I wander on my road trip in the Western US, I will have many good thoughts about you, and I will miss you, and, of course, i will start figuring out where to land my Collaborative Art Swat-Team next! The Gardeners would like to thank our guest sound track designer, Jeff Tentschert of Texas and Arizona for his wonderfully NEST appropriate soundtrack for our amazing Bowerbird NEST in Oakland. Jeff worked long and hard to make the birds tweet just right and my favorite was the menacing sound of the chainsaw intruding into paradise. Thanks also go to Joe B's brother, Terry Brubaker of Berkeley for excellent work and research into sound delivery systems...( solar powered boom box), and haunting lighting effects...( outdoor led landscape lights powered by a battery starter/charger), AND food prep and chef's duties working side by side with Will Brubaker, our amazing chef/caterer, at the blow-out BBQ the last night of the install, the cooking was great, the vino was flowing, and the NEST looked like a vision, glowing against the cobalt dusky sky. Thank you Mr. T and Mr. J for generous efforts...wear your Exquisite Gardner NEST T- shirts with pride. My niece Amelia even got into the act the last day, and lent her hands and creative spirit to our work. Thank you Amelia! Finally, would like to thank video dude Elia Vargas for his seamless and artful integration into our carnival of creative chaos..he is obviously a pro, and we can't wait to see what he comes up with for us after the editing work happens. Thanks to my son Will B. for coming up with the site, and the Bower Bird Nest concept. Thanks to Gary and Anna of Campovida Wine Tasting Bar and to Adam and the crew of Linden Street Brewery for giving us a site, with added generosity and hospitality for our work. Gerhart, the giver of Arundo! Gardeners, Terry B, Will B and Jeff H, hard at work making BBQ for the last night bash! Holden Crane's rig to transport the Nest frame. A bunch of blue themed books I am handing out to the Gardeners for preparation for The Nest Project. Now I am seeing ideas for the NEST project EVERYWHERE! Idea: recycled plywood boulder on each side of the NEST.... This boulder seen off of PCH in Laguna Beach CA. The Gardeners have a mascot! Shouldn't every Collaborative Art Installation Team have a mascot..football teams do, right? Conveniently, Joe's daughter Kate has a charismatic French Bulldog named Rocky. Rocky has a toy built from a special piece of Exquisite Gardener's trove of exquisite junk..an old metal jug. Joe figured Rocky likes noise and challenge, so a rope and the jug create the perfect Rockymania event. Hope the Gardeners don't mind this sacrifice of an awesome piece of junk. If you get lucky you might see Rocky at the next Exquisite Gardeners' event!